Emergency exit lighting is one of the underrated safety systems that could actually save your life. In this case, your healthcare facility might just be at risk for lacking emergency exit lighting systems. Medical Centres cover a wide range of facilities including clinics, aged care homes, hospitals and whatnot. It is no question that these establishments need utmost safety installations. In light of this matter, healthcare facilities are expected to obtain the necessary requirements set by the Building Code of Australia (BCA). How is your building used? What are the areas that need different lighting treatments? The same level of provision should be distributed throughout the building such that high-risk areas are supplied with better safety tools. One example would be the high risk of an enclosed kitchen to be in full blackout in a power outage due to a fire incident. The risk of evacuating while avoiding hot and sharp objects is highly dangerous. A minimum stipulation for escape lighting is set for each type of building. For multiple-storey health centres and those with many resting in-patients, a three-hour provision evacuation lighting will suffice. The essence of installing such lighting system enables occupants to stay vigilant for the entire duration of the emergency and know when the place is declared safe to re-enter. Making provisions for exit lighting should be fulfilled through determining the class of building and space in question. If your healthcare facility has a floor area of over 300m2, you are automatically required to install exit lights. Other points of consideration are the layout of walls, public access, and natural light. 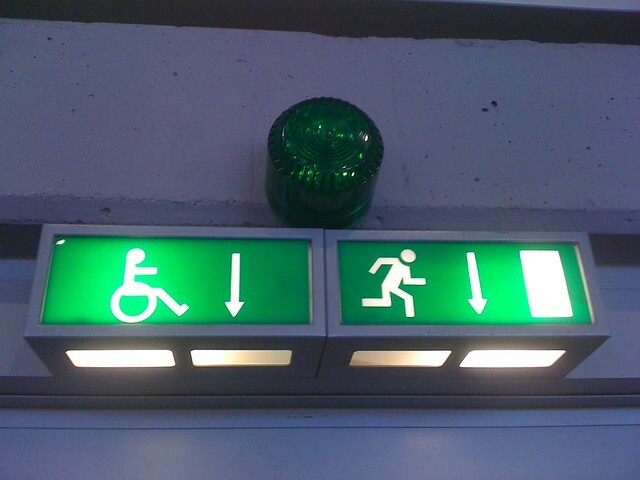 If your property is accessible to the public, it is highly required to install emergency and exit lighting. The Building Code of Australia stresses on emergency lighting standards for the building’s enclosed rooms. Doors leading to another room, passageways that are part of the path to an exit or hallway, rooms having more than 100m2 that do not open to a passageway with emergency lighting or an open space outside, should ideally have adequate natural light. Without it, these rooms would have to acquire emergency exit lighting. In times of emergency and evacuation, these lighting systems will serve as a guiding route towards safety, especially in enclosed areas without windows. As stated in the standard emergency and exit lighting provisions, locations for exit lights are to be installed in every fire-isolated stairway, fire-isolated ramp or fire-isolated passageway. Illuminance levels are expected to shine brighter on essential points such as the locations of fire-fighting equipment and first aid tools. The same is applicable for high-risk areas and alarm points. Emergency lighting ought to be designed and installed to illuminate these points. It takes a foolproof plan on fire evacuation in medical centres to ensure everyone’s safety. As long as building codes are adhered to and you are able to contact a fire and electrical contractor, there’s nothing to worry about.